blogging is the most technologically-advanced thing i do: a plea to innovators and early adopters! I still have a cell phone two versions earlier than the razor. Yea, it flips open, but not in the hip-flip-phone-kind-of way. I don’t own an iPod, or even a decent pair of headphones. I don’t have a Twitter account. Blogging is probably the most technologically-advanced thing I do all day (Sorry, it’s been a while. Don’t you hate when all of your posts have to contain apologies? ), and it took me years to start a blog. I was the pitiful classmate always waiting for a tech-savior during glitches in my PowerPoint presentation. Ever since studying the technology adoption lifecycle years ago in my Intro to Mass Comm class, I’ve envied the innovators and even the early adopters. These are the ones who joined Facebook before it was a thing, the ones who know how to use new operating systems before they’re even officially released. They could easily list PhotoShop as their second language. Oh, why have the gods of technology cursed me so? 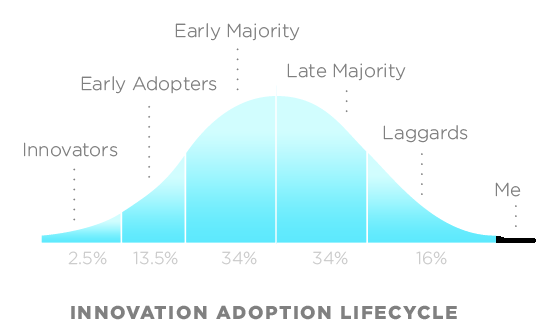 The technology adoption lifecycle, modified to include the latest of the late, a.k.a. me. So, if you’re one of those 2.5% of innovators, or even if you’re an early adopter, start a blog about it. Post how-to’s for the rest of us. Share your expertise, your wanderings and explorations in the technology universe. Teach us where to buy, what to look for, how to do cool stuff with our gadgets. Help us out. This entry was posted in blogging, how to and tagged blog, blog names, blogging, cell phones, computers, headphones, how to, innovators, laggards, mass communications, technology, technology adoption, technology adoption lifecycle, texting, tutorial, twitter by shinnyupatree. Bookmark the permalink.